In Breast Cancer, Early Diagnosis is Everything. The medical industry has seen some great technological advances in the last few decades. One of the more substantial advancements has been the replacement of physical scans with PACS and digital scans. With PACS and the digital age, radiologists are now able to view more data in a shorter time frame than ever before. Not only can multiple images be placed side by side on a screen, but hundreds of images can be stacked and then scrolled through, all in a matter of seconds. However, being able to view more data in a shorter time frame isn't necessarily as good as it sounds. Ultimately more data means that radiologists have to look through more scans than ever before, and hospitals are requiring more radiologists to cope with the increased amount of information. This technological leap from physical to digital, although improving the quality and efficiency of medical care, has brought with it many logistical problems. One potential savior in this digital world is teleradiology. Teleradiology is the practice of sending digital images to an external radiologist to interpret data for you. Recently many independent radiologists and teleradiology firms have started up, which focus on providing interpretations by qualified radiologists. Teleradiology helps solve many of the issues brought about through digitalization, by providing a service on an as-required basis. Small clinics and emergency rooms no longer need to hire several radiologists to cover a fluctuating workload - they can simply call a teleradiologist (TR) during busy times. They also no longer need to keep a nightshift radiologist on-site, as they can call a TR on the other side of the world who is awake and alert. On the other hand, large hospitals can 'hire out' their own radiologists - providing support to other clinics and hospitals. Teleradiology also helps to create new benefits - such as allowing radiologists to easily consult with specialists from anywhere in the world, ultimately improving the quality of their interpretation, and helping to share knowledge. But as with most new technologies, a unique set of problems arises. Due to the nature of teleradiology, many radiologists are opting to work from a home office. However, it can be difficult to comply with the strict regulations and standard practices of radiology such as requiring a diagnostic quality monitor without spending a significant amount of money. So, many independent radiologists need a low-cost but qualified monitor for reading scans. The RX850 also has FDA 510(k) clearance for Breast Tomosynthesis, Mammography and General Radiology making it suitable for almost any TR. It is compact enough for small spaces, but also has medical qualifications and a built-in front sensor to calibrate the monitor to DICOM Part 14. Furthermore 20,000 hours of usage time is guaranteed when used at the recommended brightness of 500 cd/m2 - making it compliant with the ACR standard of 350 cd/m2 or 420cd/m2 for mammography. "The ergonomic features and well-thought design of the RX850 saves space on my desktop and makes staring at the display for an extended period of time much less tiring," comments Dr. Nahm,"Contract-based TRs often choose lower quality monitors because of cost considerations, but with my RX850 I am now assured that I am using the latest available technology from which both doctor and patient can benefit the most." 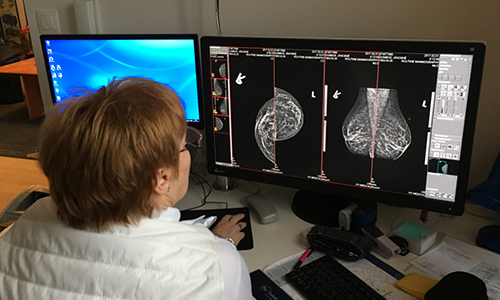 Ideally, multiple diagnostic monitors would be used, but due to a limited budget, radiologists sometimes use a combination of diagnostic monitors and consumer-grade monitors. However consumer-grade monitors are not designed for the medical industry, and often lack important features and qualifications - making the work they can perform limited and of poor quality. This may force TRs to rely heavily on one diagnostic monitor as they cannot use the consumer-grade monitors to view scans. Therefore, rather than choosing consumer-grade monitors, it is worth considering a high-performance clinical review monitor to accompany a diagnostic monitor so that scans can be viewed on both monitors. 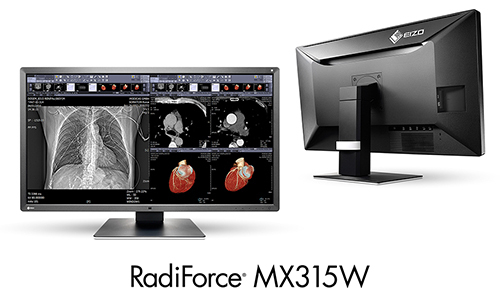 EIZO offers the RadiForce MX315W as a cost-effective clinical review monitor and an ideal accompaniment to a diagnostic monitor like the RadiForce RX850. It also comes with EIZO's own space- and time-saving function called Work-and-Flow. 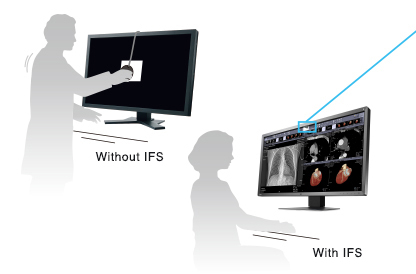 With Work-and-Flow, radiologists can easily show or hide a picture-in-picture window. In addition, they can work with multiple PCs using only one mouse and keyboard. The MX315W combines space-saving features with medical-grade qualifications. 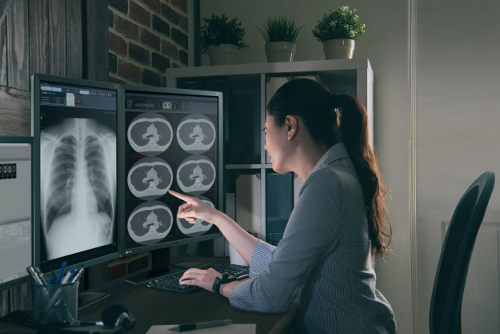 Rather than using multiple space-consuming, consumer-grade monitors that can't properly display scans, you can use this space-saving clinical review monitor for viewing a variety of medical images like CT, MRI, and ultrasound. Teleradiology has helped solve many problems that arose during the shift from physical to digital medical imaging. However it isn't problem-free in itself. Finding the right cost-performance balance can be difficult for TRs. But quality shouldn't be overlooked. 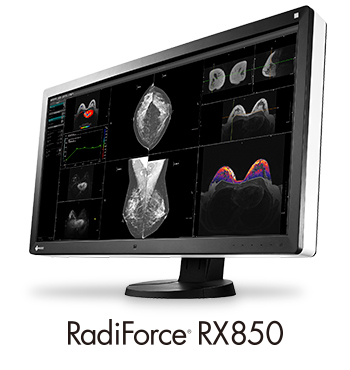 All TRs of course need a primary diagnostic monitor like the RadiForce RX850 - but rather than using a generic monitor on the side, we recommend a clinical review monitor like the RadiForce MX315W for high quality, DICOM compliance, and automated calibration and quality assurance with the Integrated Front Sensor.